This report provides a glimpse into the sixth International Conference that took place in Jakarta from the 9th to the 13th of June 2013. It is not a detailed description of events, but rather an overview of the key outcomes of the sixth International Conference. 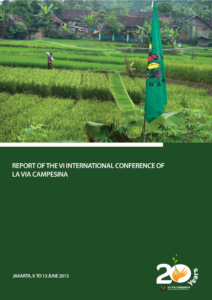 The International Conference is the space where La Via Campesina makes its fundamental decisions. Its political positions, strategies and action plans are formulated here.